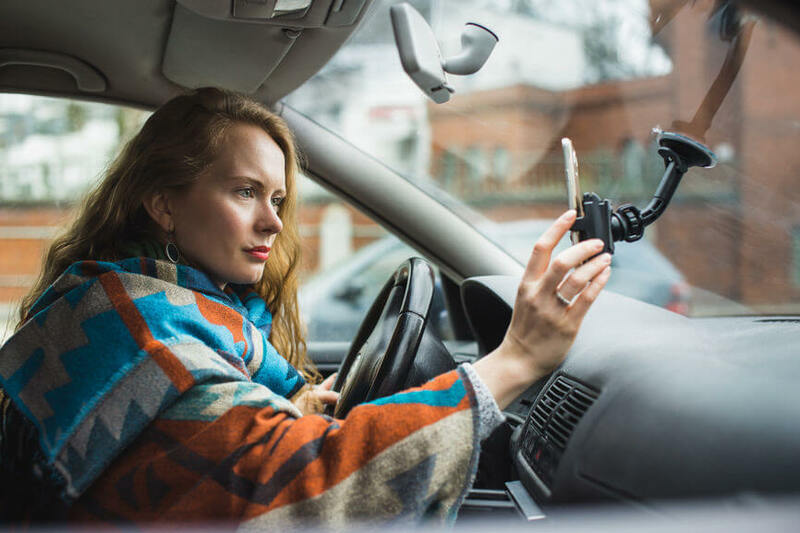 Whether you drive for Lyft full-time or part-time, you’re now enjoying the pay, perks, and prerogatives of being self-employed—from setting your own hours to building customer relations. With the onset of tax season, you face a new business challenge: filing your taxes in a way that minimizes your tax liability. Follow these tips on how to use your Lyft 1099 to complete your tax return and maximize your tax deductions. A 1099-K if you generated more than 200 transactions and more than $20,000 in gross ride receipts from passengers in the last year. This is the IRS requirement, however, you are likely to receive the 1099-K even if you have fewer transactions with less gross receipts. Keep in mind, you are responsible for reporting all the income you earn, whether you receive a 1099 or not. For example, if you earned $400 in referral fees, you may need to report that income, even if you didn’t receive a 1099-MISC. You can always see exactly how much you earned in driving and non-driving income on your Lyft Driver Dashboard. Many new Lyft drivers have the misconception that they only need to report income reported on a 1099. This isn’t true; all income must be reported. Failing to report your income can cause tax problems down the road. The IRS can audit your taxes going back three tax years (or six years if the IRS finds you have under reported your income by 25%). If you report both driving and non-driving income next year, but only report driving income this year, that might raise a red flag for the IRS. These report your gross earnings in each category. You might notice that the amount in Box 1a of 1099-K is larger than the total amount you actually got paid. This is not an error. The figure on the form reflects the total amount your customers paid, including the Lyft commission. Don’t worry, generally you can deduct Lyft fees from your income as a business expense. As a business owner, you’ll calculate your ridesharing earnings on Schedule C, Profit or Loss from Business. 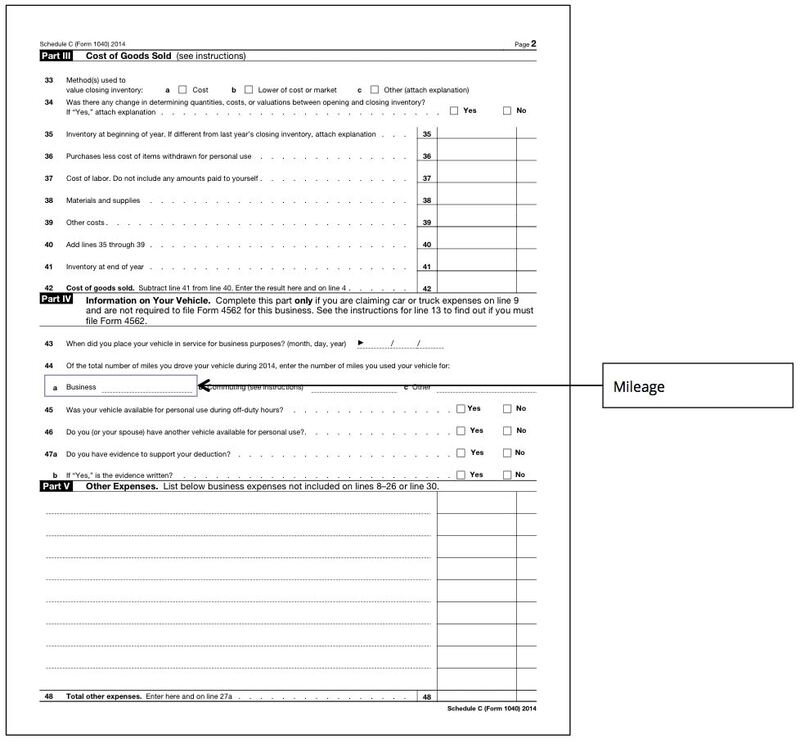 If you are using TurboTax Self-Employed, check out How do I enter my Lyft tax information? for step-by-step instructions. The total of your driving and non-driving income goes on line 1. The Lyft Annual Summary sheet also reports your Online Miles, which might only be a portion of your business miles. 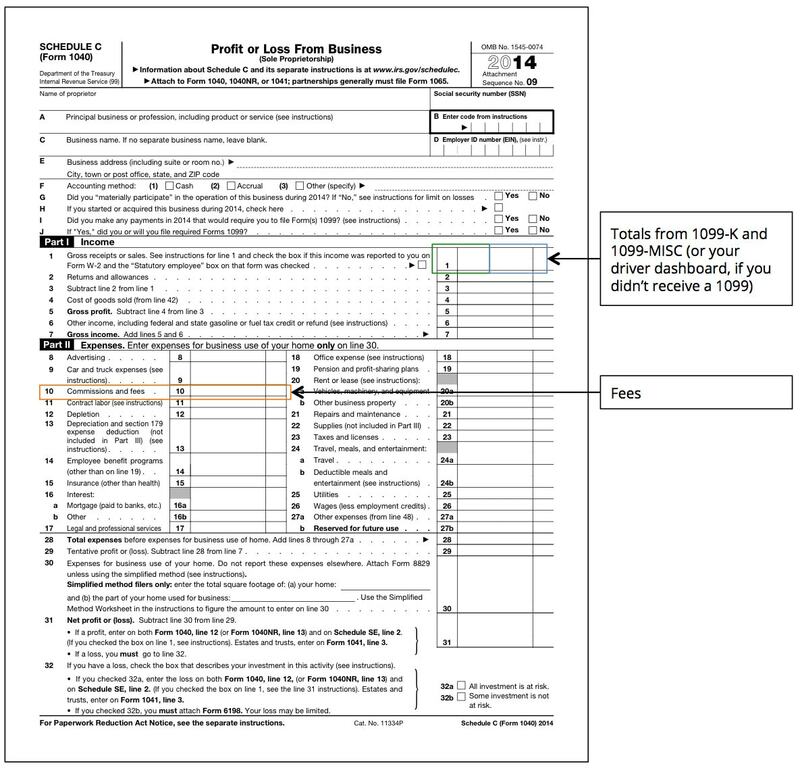 The example below shows how you’ll enter your total business mileage on line 44a of Schedule C. These miles are the starting point for calculating your “car or truck expenses,” which you will report on line 9 of Schedule C.
Form 1040, your personal tax form, where you will enter the income you earned from all sources: W-2/employee work, other self-employment, unemployment, etc. Do I need to complete separate Schedule Cs or SEs for the 1099-K and 1099-MISC? No. You can combine the income from both 1099s on one Schedule C, since both forms relate to the same business. In fact, you can include the income from any other driving services you may have provided on the same Schedule C.
If you earn self-employment income from other types of businesses, you’ll need to complete a separate Schedule C for each business you run. For example, if you operate a Homejoy cleaning services business, you’ll complete a separate Schedule C for it. To report all your annual income, you’ll need to total up all the profit from your Schedule Cs and use this number on both Form 1040 and Schedule SE. What mileage can I claim as a business expense for my Lyft driving? Lyft’s Annual Summary sheet and your Driver Dashboard both show all miles driven while you waited for a ride, were en-route to a passenger, and while you were on a ride. You generally can report all this mileage, because you were working at the time. You might be able to deduct additional mileage if you can show that it was related to your business. To claim business miles from offline driving, you must have detailed records of each trip, including its purpose. Why are there two 1099s for my ridesharing business? The rules for the issuance of forms 1099-K and 1099-MISC are spelled out by the U.S. tax code. Lyft provides both to be in full compliance with IRS rules. Do I send my 1099s to the government along with my tax return? No. Forms 1099 are not returned with your tax return. Use them to calculate your gross income and then keep them for your records. If you didn’t receive one or both 1099s, report the income from your Driver Dashboard and take a screenshot or print out the page for your records. What else can I do to reduce my tax bill? TurboTax Self Employed software can help you identify all of your business expenses, personal deductions, and credits you might be eligible to receive, lowering your tax bill and maximizing your refund. Check out How do I enter my Lyft tax information? for step-by-step instructions.